Day 3: Dublin. The weather forecasters nailed it, but then that wasn't too difficult. All of Ireland and Great Britain have dealt with three cyclonic windstorms (similar to hurricanes) in the past month. Another appears to be developing in the Atlantic west of Ireland. At any rate, when we arose this morning, rain and wind were assailing the city of Dublin. Definitely not a day to set out on foot, nor in our car with parking so limited in the city. With assistance from the Hilton's front desk, we were hooked up with a friendly Irish taxi driver named Shay, who lives north of the city. Estimating four hours as our maximum wet weather sightseeing tolerance, we asked for Shay to pick us up at 11:00. He was prompt and friendly and even brought a large, quality umbrella for us to use. 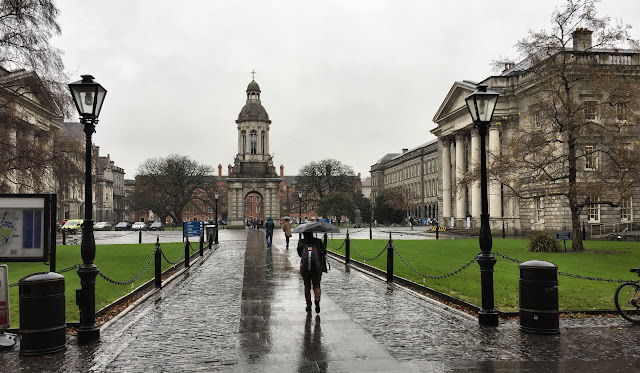 Our agenda, which turned out to be a bit too ambitious, began at Dublin's Trinity College. 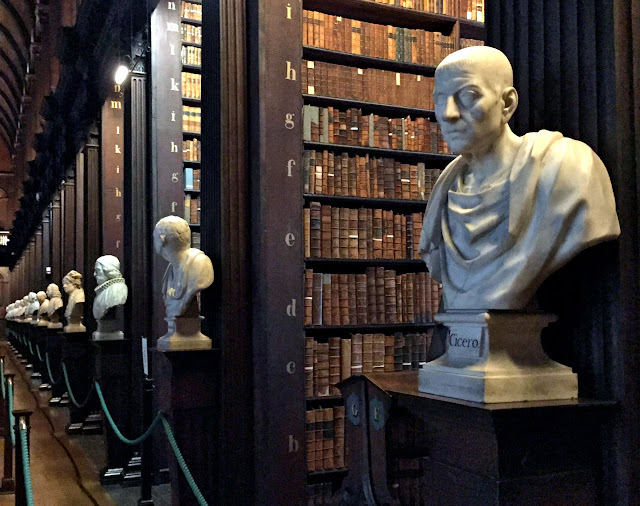 Founded in 1592, Trinity holds treasures in its library which we wanted to see. Shay dropped us off as close to the library as he was permitted, and we took his mobile phone number to communicate when we were ready to depart. 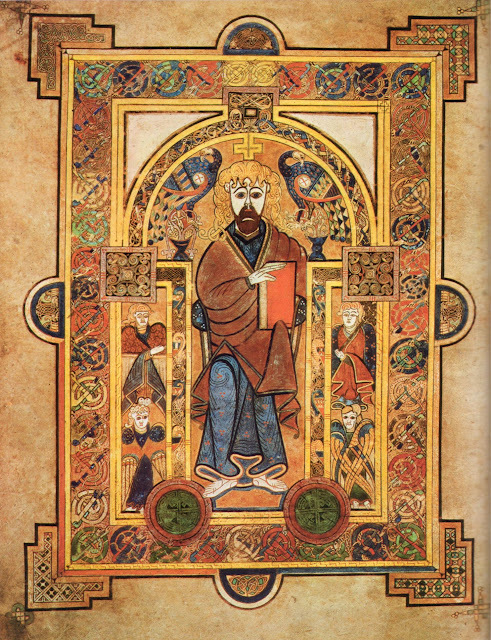 Having heard rave reviews about Dublin's second most popular tourist attraction (after the Guinness Storehouse), we charted our course for the Book of Kells, a 1,200-year-old, lavishly decorated medieval manuscript of the four Gospels. Created in the Dark Ages around the year 800 A.D. in a monastery in either Britain or Ireland, the document features intricately detailed illustrations and precise Latin calligraphy painted on calfskin vellum. The college has developed an elaborate exhibit highlighting features of the book. In the 1950s, the book was rebound into four separate volumes, one for each of the Gospels. 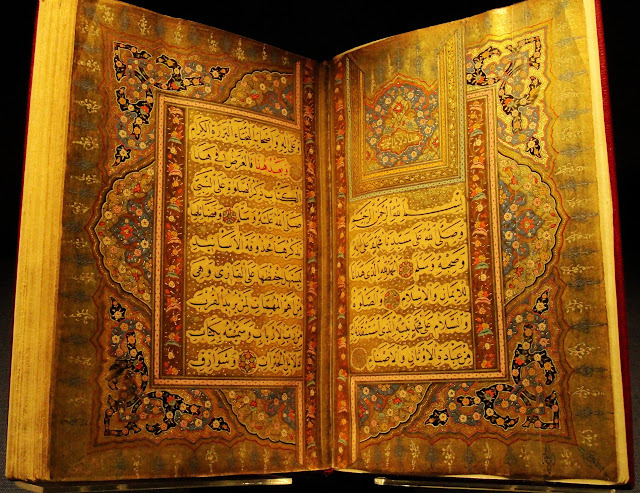 At all times, two of the books are on display at the library, both open to display pages, with one featuring the calligraphic text and the other showcasing artistic decorations. Photographs are strictly forbidden in the exhibit. According to the guard on duty a few feet from the books, the pages are turned every three months. Having been on the job a bit over a year, he has seen eight pages in each of the two books currently on exhibit. 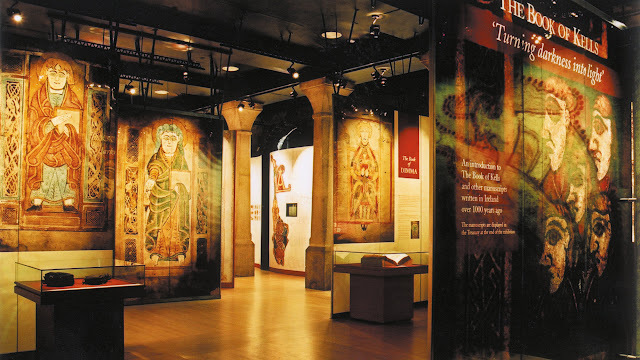 From the special Book of Kells exhibit, we walked to the majestic and aptly named Long Room, a 213-ft by 40-ft space housing nearly a quarter million of the library's oldest books and manuscripts. When it was first built between 1712 and 1732, the room had shelves only on the lower level with a mezzanine around the top. But the library's collection expanded beyond this capacity. 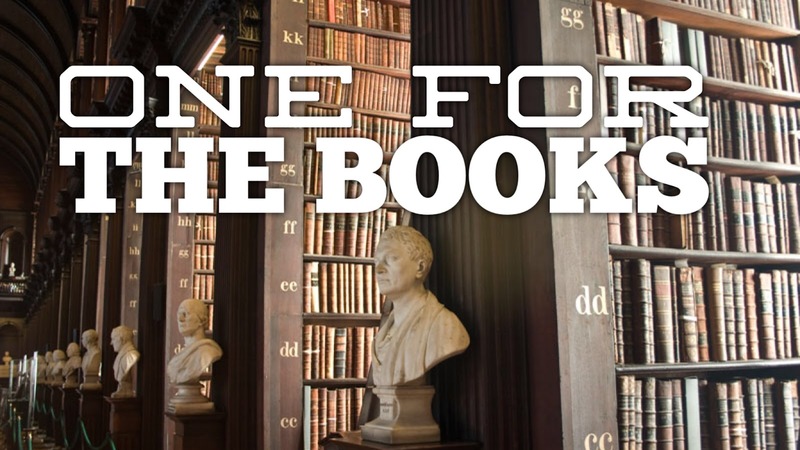 Beginning in 1801, the Trinity College library was designated a legal deposit library, entitling the institution to claim upon request a free copy of every publication produced in both Britain and Ireland. By the 1850s, the collection had completely outgrown the first floor spaces. In 1860, Trinity raised the roof, installed the barrel-vaulted ceiling and put in another level of floor-to-ceiling shelves for the overflow. Along the aisles are marble busts of famous writers and thinkers, from Socrates to Shakespeare, a tradition begun in 1743. 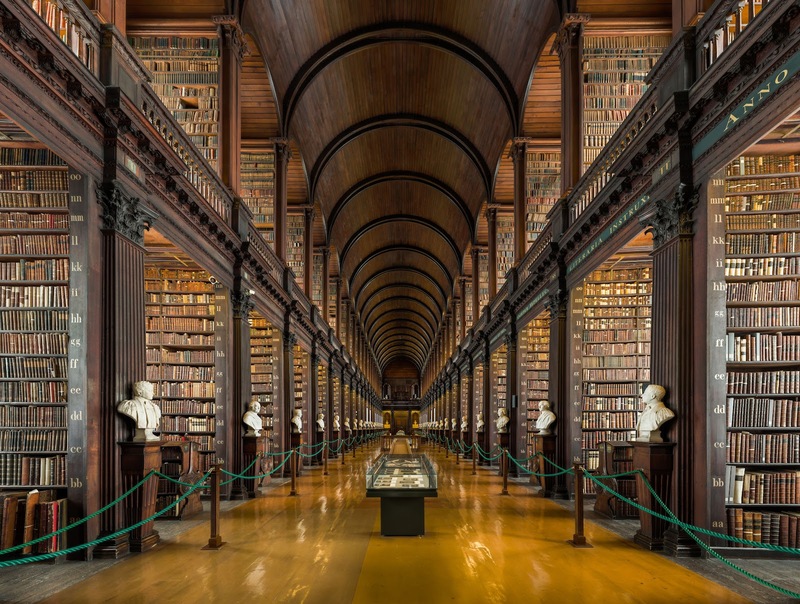 Today the Trinity College Library holds the largest collection of manuscripts and printed books in Ireland with more than three million volumes spread across eight separate buildings. Next on our list of places to see was Dublin Castle. We had tried to visit this former seat of government during British colonial rule when we were in Ireland four years ago, but the castle was closed to the public in preparation for a state visit from Queen Elizabeth, the first time a British monarch had traveled to Ireland in 100 years. There were no such barriers today, but Shay insisted we must also see the Charles Beatty Library located on castle grounds, and that is where he dropped us off to splash to the building's entrance. The library was established in 1950 to house the personal collections of Chester Beatty, an American-born British mining magnate. From a young age, Beatty was fascinated with collecting. As his age and fortunes advanced, his holdings grew into a rich collection of artistic treasures and artifacts, with a special emphasis on unique books and manuscripts. In his later years, Beatty retired to Ireland, residing in Dublin for the remainder of his life. He became the first recipient of honorary Irish citizenship at age 82. 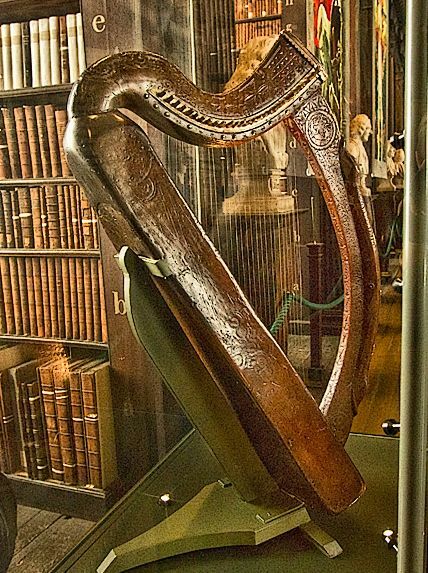 Upon his death, Beatty bequeathed his vast collection to a trust for the benefit of the Irish people. The library's Arts of the Book exhibit displays dozens of books and manuscripts from the ancient world including a papyrus of love poems dating back to 1160 B.C. Exquisite illuminated copies of the Koran date from the 800s to the 1800s. Also included are some of the earliest Gospel and other New Testament texts, dating back to 200 A.D. Though the Book of Kells was interesting, the Beatty exhibit, with its multitude of older works, puts it in a completely different perspective. We were glad we had visited Trinity first. Before leaving the Beatty Library, we took time for lunch in the institution's Silk Road Cafe. 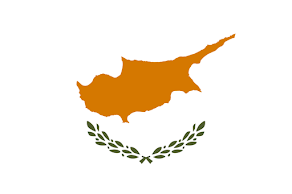 Their middle eastern menu offered a variety of fresh and flavorful salads, entrees, and pastries, reasonably priced and served by a congenial staff. Then finally we were off to Dublin Castle proper, where the State Apartments were open for a self-guided tour. The original Dublin Castle was constructed in the early 1200s, but most of it was destroyed by fire in 1673. The current castle building dates to the early 1700s with one tower remaining from the 13th century fortification. After Irish independence in 1922, the British crown handed the castle over to the government of Ireland. Since then, the castle has served as a place of national prestige, hosting important State events including the inauguration of the Irish President every seven years. 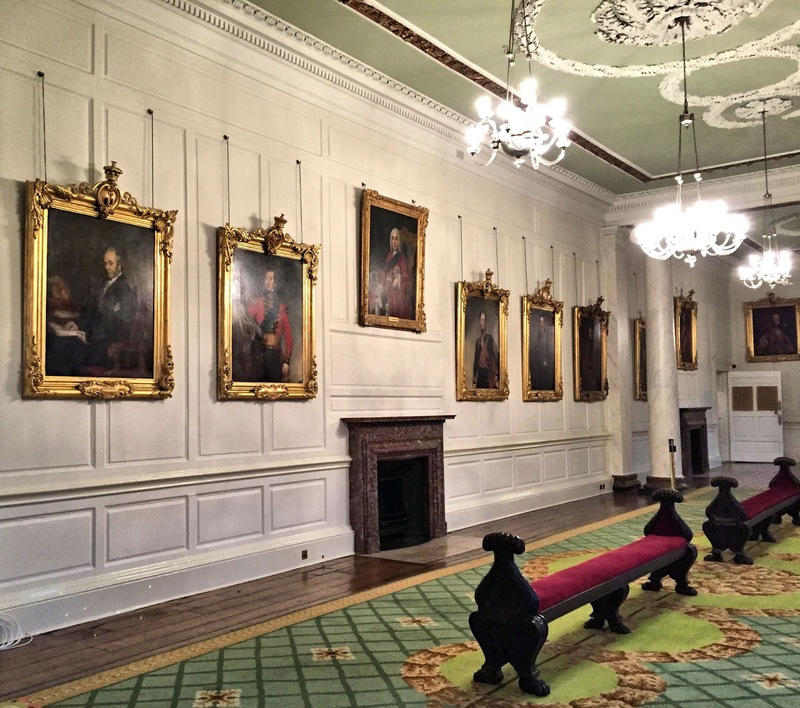 Formerly used as the personal residence of the British Lord Lieutenant, the richly decorated State Apartments are the center for special occasions, as when they were used for public entertaining during colonial times. One of the oldest and grandest rooms is St. Patrick's Hall, formerly the ballroom. 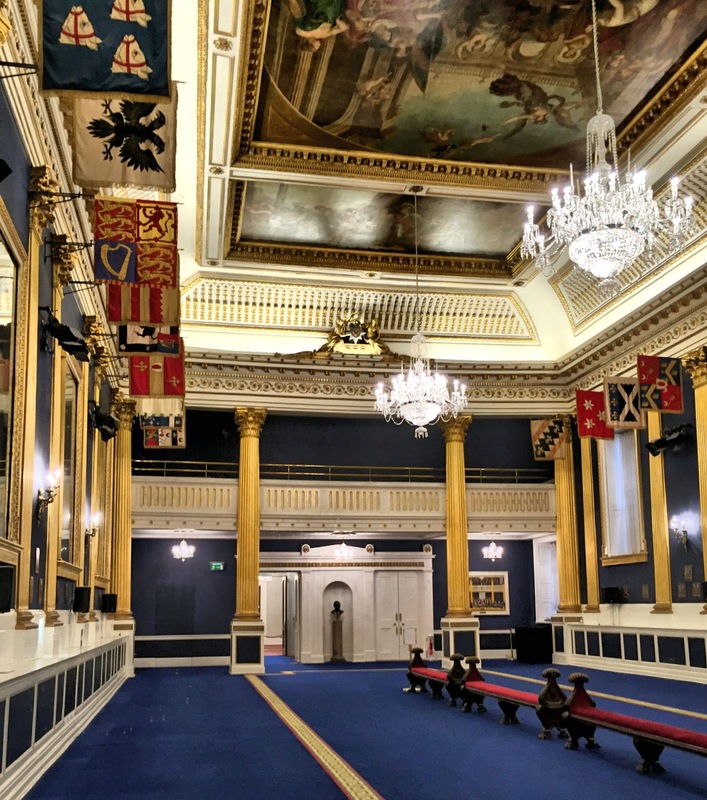 Today it is the most important ceremonial room in Ireland, used for such events as banquets for visiting dignitaries and the inaugural ceremonies. As we neared the end of our tour of the State Apartments, dreading the need to slosh back to the place a half a block away where Shay would pick us up, we chanced to glance out a window and were delighted to see his taxi waiting just outside the exit door. "The traffic's mayhem," he exclaimed as we dived into the back seat. It didn't take long to see that he had not exaggerated as we crept through the city streets at a snail's pace in the pouring rain. Both Christ Church Cathedral and St. Patrick's Cathedral were on our "to see" list, but with our four hours all but done and the torrent showing no sign of easing, we declined Shay's offer to extend our booking. Since we plan to fly out of Dublin at the end of this trip, we'll have at least one more opportunity to see the cathedrals, Phoenix Park, and some of the other Dublin sights we missed. 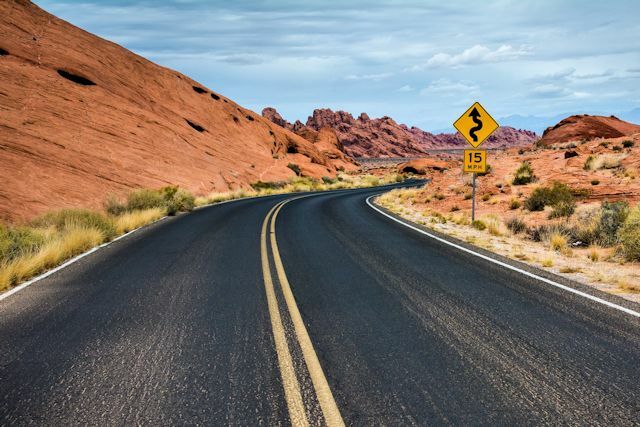 For now, it's time to move on south. Tomorrow we'll drive to Kilkenny, with some interesting stops along the way. Riding with us will be Shay's "professional" umbrella, which he insisted we keep after seeing my tiny travel version. Weather - 41° to 43°, RAIN! 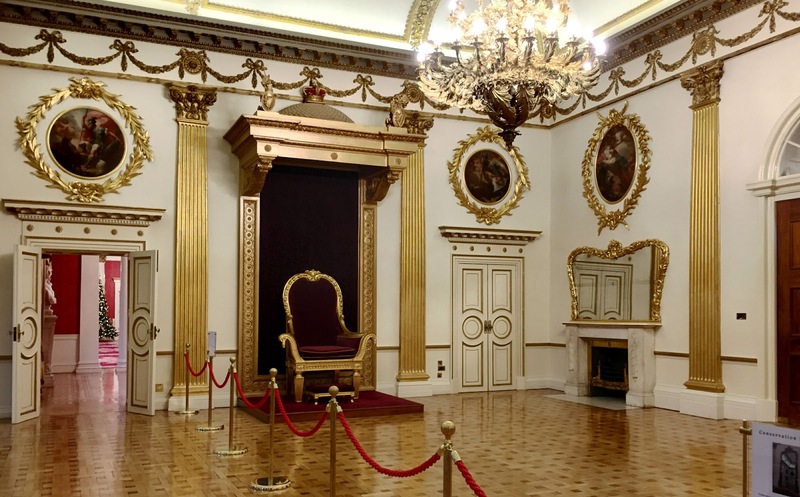 Portrait gallery at Dublin Castle was originally a supper room hosting banquets involving 16 to 30 courses.